How To Make Lisa Roukin’s Grain Free Plantain Pizza. Looking for a new pizza recipe? Fancy making a Lisa Roukin’s Grain Free Plantain Pizza? 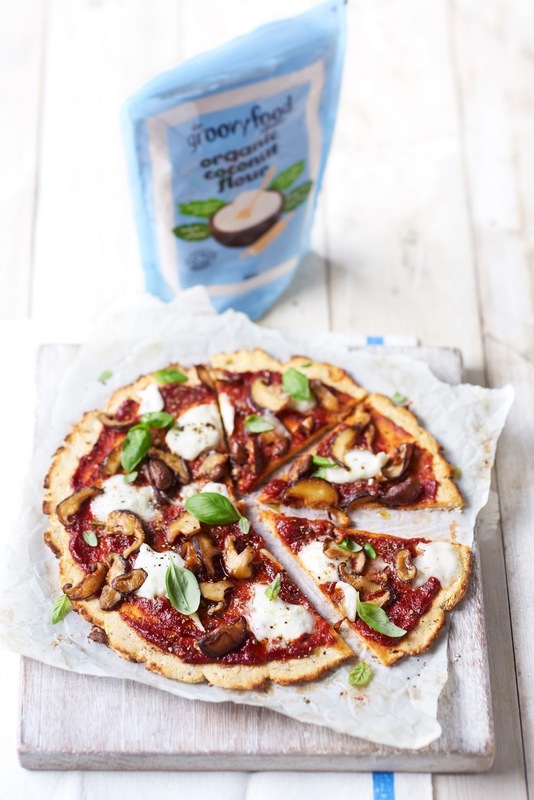 (Delicious grain free plantain pizza with a hint of coconut). 1. Pre-heat the oven to 425°F, gas mark 7, 220°C (200°C fan-assisted). 2. Put the plantain in a bowl and mash with the back of a fork until completely smooth. 3. Add the egg and beat in with the plantain, blend until mixed together and then season with sea salt and garlic granules. 4. Add the coconut flour and combine together until a thick paste and shape into a ball. 5. On a baking tray pre-lined with baking parchment or silicone baking mat, pat your plantain mixture evenly onto the baking mat in a round shape (9 inches), ½cm thickness and smooth it out so there are no bumps at the top. Place it in the oven for 14-15 minutes. Depending on your oven, you may need to turn the tray around halfway to make sure it’s evenly cooked. 6. Whilst the pizza base is in the oven, make the tomato sauce. 7. In a bowl mix together the tomato puree with water, until a smooth consistency, add the sundried tomato paste, agave nectar, sea salt and black pepper and mix together. 8. Slice the mushrooms and set aside. 9. Once the base is cooked, take it out of the oven and carefully flip it over. Smooth the tomato sauce over the base and top with the mushrooms and ripped mozzarella strands. 10. Drizzle with a touch of olive oil and season lightly with sea salt and mixed herbs. Place back in the oven for a further 9-10 minutes. 11. Once cooked take out, garnish with basil leaves. Options for toppings are endless! Why not make this pizza with different varieties of mushrooms and anchovies or simply add sweetcorn, caramalised onions. When serving, drizzle the pizza with chilli oil or truffle oil instead of olive oil for an added flavour. You can find plantain in most large supermarkets or speciality food shops. Plantains are from the banana family, but are seen as a vegetable and not a fruit. They need are not suitable to eat raw and must be cooked. Plantain is highly nutritious, a good source of potassium and vitamins A and C.
How To Make Lisa Roukin’s Grain Free Plantain Pizza. Recipe and image courtesy of The Groovy Food Company. How To Make Lisa Roukin’s Raw Chocolate Mousse Cake. How To Make Crispy Bbq Chicken With Avocado Salsa. "How To Make Crispy Bbq Chicken With Avocado Salsa"
"Life Lately: The Wednesday Blog Hop"
This looks so. Tasty. Yum..
MMMMM, you make me hungry!